WE'RE VERY SORRY IF YOU'RE HAVING DIFFICULTY! IF YOU OPEN ANOTHER BROWSER, ALONG WITH THIS WINDOW TO FOLLOW ALONG, WE ARE SURE YOU'LL BE ABLE TO ORDER QUICKLY AND WITHOUT A PROBLEM. First, we recommend you set your viewing window screen to a wide screen. Some buttons may be out of the viewing area when the viewing window is reduced. 1. Clear and reset the order registers by clicking Log-Out. 2. 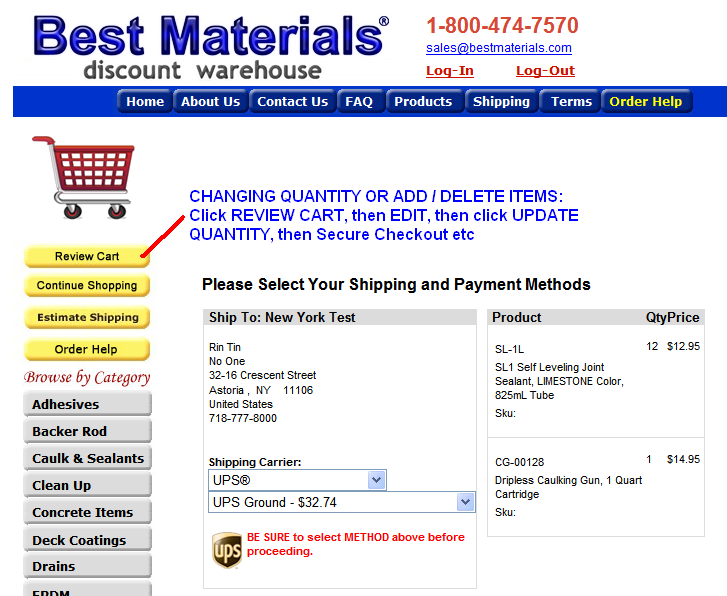 Select your items, then QTY, then click ADD TO CART. 3. Hint: Be sure and click buttons slowly. If you click quickly, functions may not work. Please try again. Click and hold for a second. 4. Click in the upper LEFT corner under the shopping cart. 5. You are now at the "Summary of Your Order" page. Review your order. 7. You are now at the "Sign In to Your Account" screen. Sign in or create a new account. 8. You are now at either the "Ship To Information" or the "Select A Shipping Address", depending if you are a new or returning customer. Enter Shipment Address. The "Save As" means Home or Work or such. Unclick the "Use Same Address for BILLING", if needed. 10. You are now at the "Shipment Summary" page. 11. Add any "Special Instructions" or comments relating to item selection, order delivery, special shipping account or such. 12. Select Payment Method (bottom right). Choose either Credit Card (default selection) or Paypal. 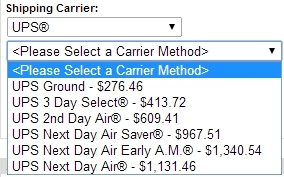 NOTE: You must first select Carrier and Carrier Method above BEFORE you'll see the yellow CONTINUE button. This takes you to final step - payment information. Paypal users: You will be redirected to your secure Paypal account for login and payment approval. You MUST click the "RETURN TO MERCHANT / CONTINUE" button on the Paypal site at the completion of the Paypal transaction. This takes you back to our site and completes the order processing on our storefront. If you fail to hit the CONTINUE button, we may not get a record of what you ordered (yet your payment WILL complete), and you will not get a copy of your order. If this happens, please email sales@bestmaterials.com with your order AND shipment information. We will then complete your order. You are now at the "Payment Information" page. 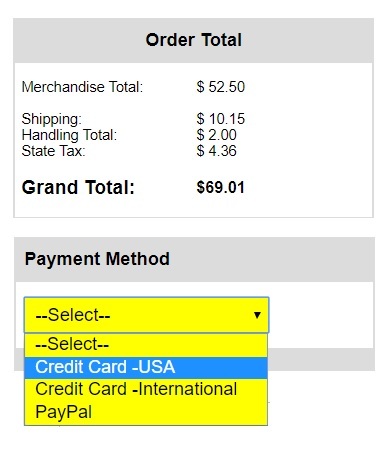 If your billing and shipping addresses are the same you should now be at the "Payment Information" page. Otherwise if your CREDIT CARD billing address is different from the shipping address, you will be at the "Billing and Account Information" page. Enter the BILLING address of the CREDIT CARD. CREDIT CARD USERS: Fill in your credit card info. NAME: This is the exact name on the Credit Card. ADDRESS Verification: Your street address and ZIP code MUST match that of the BILLING address of the credit card. 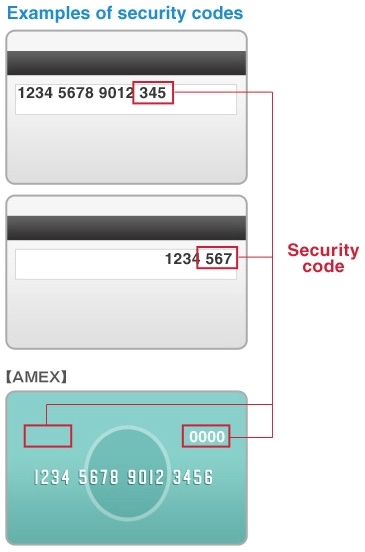 Security Code: This is the 3 or 4 digit code located on the BACK of the card on the signature stripe. Its the last group of 3 or 4 digits. Typically, 3 on VISA. 14. You will get an on-screen acknowledgement and and then an email will be sent to you (Order Acknowledgement). If you selected UPS, within 24 hours you should get another email with the shipping tracking information. USPS and other shipments receive tracking information a day or so later. 16. For your added security, BE SURE to Log-Out. IF YOU DO NOT GET AN ON-SCREEN ORDER CONFIRMATION number your order probably did not process. Press Log-Out and start over with a NEW browser window. If your order was rejected, please review the address and security code information entered as noted in the Security section at the top of this page. Our system is secured. It will not accept incorrect billing addresses. If you try to re-enter your order after a credit card rejection you MAY get a "Duplicate Order" message. Your order is NOT duplicated it is just a reminder. If you continue to have a problem: Please email us with your order request and payment info. We will process it quickly. a. The billing address or zip code does not match that on file with your credit card company. You may have incorrectly typed your billing address. b. Your credit is over limit and denied by the card company. c. The ship-to address is not on file with your credit card company. d. You are using a non U.S. bank issued credit card which does not support verified billing addresses. If you are outside the US, or visiting, use a U.S. bank issued card, or use Paypal, or call us to arrange wire payment. We can also accept payment advance by mailing us a check. 2. Credit Cards & Ship-To Addresses: If you are paying by credit card and if the ship-to address is different than your credit card billing address, you may need to set up the ship-to address as an alternate address with your credit card issuer (which enables your address to be verified during the security check process). You can set-up an alternate ship-to address in a few minutes by simply calling your credit card company using the toll-free number on the back of your credit card, and telling them you would like to set up an alternate shipping address. This is for YOUR credit security. 3. Canadian Shipments: If you are having order errors, try entering the zip code WITHOUT a space. For example: V0M1A1 rather than V0M 1A1. See other tips at our Shipping page or Canadian Shipping Help. Problems? Call 1-602-272-8128. 4. Editing Cart: If you wish to change quantity or add/delete items, just click and change it there. Then click UPDATE QUANTITY. 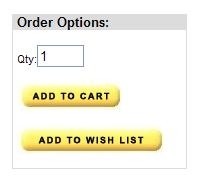 Then click SECURE CHECKOUT and follow prompts. See Example.